Khādir or Khadar and Bāngar (Hindi language: खादर और बांगर, Urdu languageکهادر اور بانگر) are terms used in Hindi, Urdu, Punjabi and Sindhi in the Indo-Gangetic plains of North India and Pakistan to differentiate between two types of river plains and alluvial soils. Khadir or Khadar (Hindi: खादर) plains are those that are low-lying next to a river. Khadar areas are prone to flooding and sometimes include portions of former river-beds that became available for agriculture when a river changed course. It is moisture retentive and sticky when wet  Khadir soil consists of new alluvial soil deposits and is often very fertile. Bangar plains are more upland, and consist of older alluvial soil. Bangar (Hindi: बांगर) is not to be confused with sandy arid Bagar region which is also mainly not prone to the flood, but regions outside of Bagar region may have both Khadar and Bangar areas has both bangar and Khadar areas within same village (see Doab for better clarity). Bangar area are less prone to flooding but are usually more sandy and less fertile as well. 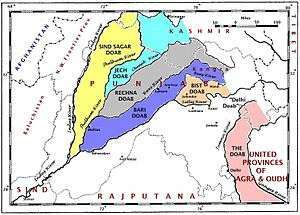 Since North India and Pakistan are coursed by a multiplicity of Himalayan rivers that divide the plains into doabs (i.e. regions between two rivers), the Indo-Gangetic plains consist of alternating regions of river, khadir and bangar. 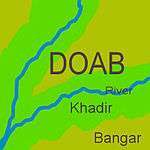 The centers of the doabs consist of bangar and the peripheries, which line the rivers, consist of khadir. Historically, villages in the doabs have been officially classified as khadir, khadir-bangar (i.e. mixed) or bangar for many centuries and different agricultural tax rates applied based on a tiered land-productivity scale. In some areas, these terms have become incorporated in several village names themselves, such as Murshidpur Bangar and Ranchi Bangar-Khadir in Mathura district of Uttar Pradesh. Other places include Chilla Saroda Bangar, Gharonda Neemka Bangar, Pehlad Pur Bangar, Rampur Bangar and Salarpur Khadar.